The fantasy football waiver wire can often make or break your season. Making the right decision on which players to add and drop is crucial, so we have you set up with a deep list of potential waiver wire adds for Week 7. Jameis Winston, TB (15-30%) — Don’t expect four touchdowns and nearly 400 passing yards every week, but Winston is still widely available and should be owned in all formats. Marlon Mack, IND (15-30%) — Mack was back on the field in Week 6 and saw 55% of the team’s carries. Expect a committee to continue in Indy, but Mack will be in the lead. Tarik Cohen, CHI (15-30%) — He’s surprisingly available in 24% of leagues and is a must-add after another strong performance in Week 6. 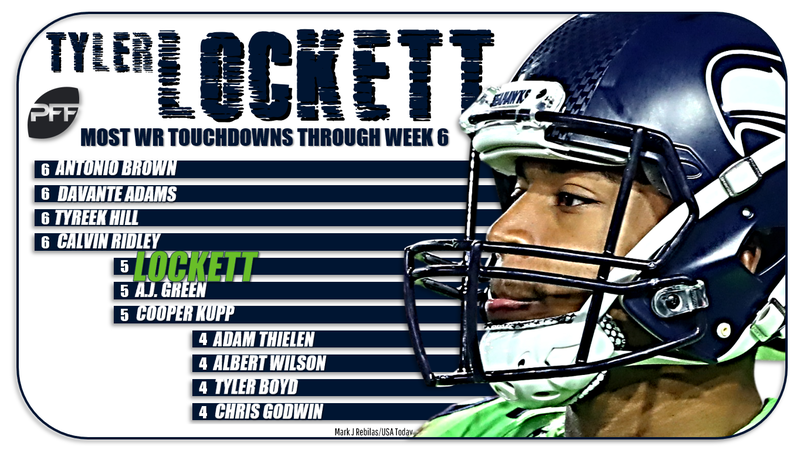 Tyler Lockett, SEA (25-50%) — Lockett is tied for fifth among wideouts with five touchdowns and is shockingly available in 23% of leagues. Taylor Gabriel, CHI (15-30%) — Gabriel followed up his big Week 4 performance with a 100-yard day. He should be owned in all formats. Albert Wilson, MIA (10-20%) — Lightning struck twice for Wilson already this season. While he’s the third receiver in Miami, his upside is very appealing for fantasy purposes. Chester Rogers, IND (10-20%) — Rogers topped double-digit targets for the third straight week and also found the end zone. Evan Engram, NYG (25-50%) — Fed up fantasy owners dropped Engram making him available in 36% of leagues. He should be back on the field this week. O.J. Howard, TB (15-30%) — Howard was able to return quicker than expected and put up strong fantasy numbers in Week 6. David Njoku, CLV (15-30%) — With the Browns banged up at wide receiver, Njoku’s role expanded in Week 6. Look for that to continue going forward. Mitchell Trubisky, CHI (5-10%) — Trubisky followed up his massive Week 4 performance with another strong game. His fantasy arrow is pointing up. Baker Mayfield, CLV (5-8%) — Last week’s stat line certainly doesn’t impress, but Mayfield did throw four balls to the end zone and has a tasty matchup on tap against the Bucs. Dak Prescott, DAL (3-5%) — He’s been a QB1 over the last two weeks, thanks in part to his 17 rushes for 116 yards and a score. C.J. Beathard, SF (3-5%) — It isn’t always pretty with Beathard, but since taking over as the starter in San Francisco, he’s ninth among quarterbacks in fantasy scoring. Peyton Barber, TB (10-20%) — The Bucs backfield is far from stable, but Barber proved to still be the clear lead back following their Week 5 bye. Corey Clement, PHI (10-20%) — Expect Philadelphia to use a full-blown committee going forward. Clement gets the slight edge over Wendell Smallwood as the preferred fantasy option. Aaron Jones, GB (10-20%) — There’s a frustrating committee in the Packers backfield, but Jones is available in 39% of leagues and should be owned. Latavius Murray, MIN (8-15%) — With Dalvin Cook banged up, Murray showed he has the potential to produce RB1 numbers. At the least, he should be stashed. Wendell Smallwood, PHI (8-15%) — Smallwood led the Eagles in touches last week, but Corey Clement was the better fantasy option. Duke Johnson Jr., CLV (5-10%) — Volume is going to be an issue with Johnson, as he averages just 5.5 touches per game. But the Browns back did flash upside in Week 6 with 73 receiving yards. Nick Chubb, CLV (3-5%) — Chubb hasn’t done much since his breakout performance three weeks ago, but he’s still a premium stash option. Ito Smith, ATL (3-5%) — Smith’s role continued to increase last week, but keep in mind that he’ll go back to a reserve role once Devonta Freeman returns. Frank Gore, MIA (3-5%) — The veteran topped 100 yards against a good Bears run defense. Though he lacks major upside, Gore’s floor can help you through the bye weeks. Tyrell Williams, LAC (5-10%) — Yes, his stat line jumps off the page, but keep in mind that Williams only saw four targets in Week 6. Terrelle Pryor, NYJ (5-10%) — With Quincy Enunwa banged up, Pryor could see his role expand in the next few weeks. Chris Godwin, TB (5-10%) — Godwin’s Week 6 stat line looks good, but there’s some concern over his usage as essentially the Bucs’ No. 4 wideout. Willie Snead IV, BAL (3-5%) — The veteran receiver has seen 40 targets through the first six weeks of the season, which is just two fewer than teammate John Brown. Christian Kirk, ARZ (3-5%) — The Cardinals offense is tough to trust right now, but Kirk’s upside could surface down the stretch this season. Austin Hooper, ATL (10-20%) — Hooper has taken advantage of favorable matchups over the last two weeks, but he’s proven to be a very streaky fantasy option over his career. Vance McDonald, PIT (5-10%) — McDonald isn’t a lock to be the Steelers’ top fantasy tight end every week, but his upside is worth a look in regular-sized leagues. Sam Darnold, NYJ (1-3%) — Darnold has flashed upside over the last two weeks with five passing scores. Only Russell Wilson and Andrew Luck have more over that span. Brock Osweiler, MIA (1%) — Osweiler’s Week 6 performance was one of the biggest fantasy surprises of the season. Don’t expect that to continue going forward, but he’s worth consideration in 2QB leagues. Chad Kelly, DEN (1%) — The clock is ticking for Case Keenum, so it’s worth pre-emptively adding Kelly in 2QB leagues. D’Onta Foreman, HOU (1-3%) — He isn’t likely to return this week, but Foreman is getting closer to being back on the field. Rashaad Penny, SEA (1-3%) — Penny outcarried Mike Davis in Week 6, so he’s back in stash consideration. Raheem Mostert, SF (1%) — The 49ers back impressed Monday night with 12 carries for 84 yards. Ronald Jones, TB (1%) — Peyton Barber was the clear lead back in Week 6, but Jones was involved in the passing game. He’s still worth stashing. Jalen Richard, OAK (1%) — The third-year man had 9 touches in Week 6 and was especially effective as a receiver with seven catches for 48 yards. Danny Amendola, MIA (1-3%) — Albert Wilson had the big fantasy numbers, but Amendola actually led the team in targets in Week 6. Anthony Miller, CHI (1-3%) — The rookie found the end zone in Week 6, but it was his only catch and his role remains somewhat limited. Josh Reynolds, LAR (1%) — With Cooper Kupp likely sidelined this week, Reynolds is the next man up in LA. Damion Ratley, CLV (1%) — With attrition hitting the Browns wide receivers, Ratley surprisingly led the team in catches last week. David Moore, SEA (1%) — Moore scored again this week, but keep in mind that he’s the No. 3 behind Doug Baldwin and Tyler Lockett. Ricky Seals-Jones, ARZ (3-5%) — Seals-Jones has been far from consistent, but he’s coming off a solid day in Week 6. C.J. Uzomah, CIN (3-5%) — The Bengals are losing tight ends left and right, so Uzomah should see plenty of work going forward. James O’Shaughnessy, JAX (1%) — With Niles Paul now banged up, the Jags will likely have to turn to journeyman O’Shaughnessy as their primary pass-catching tight end. Indianapolis Colts (1%) — The Colts are far from a standout defense, but they have a very appealing matchup on tap against a Bills offense that will be without starter Josh Allen. Los Angeles Chargers (1%) — Don’t expect 11 sacks from the Chargers, but the Titans showed last week that they can give up fantasy points in bunches to defenses. Denver Broncos (1%) — Arizona has surrendered double-digit fantasy points to 4-of-6 defenses they’ve faced this season.